Gin hit our shores in the 17th century after William of Orange encouraged the production of the Dutch spirit using surplus barley and wheat. At its height in London, 1 in 4 houses in the city were producing and selling their own form of gin and during this time it was seemingly cheaper to buy gin than clean drinking water. Gone are those days, but Gin is still ever popular among these shores with the spirit the foundation for some of the greatest drinks ever made – including the drink made famous by James Bond. Martini shaken not stirred. There are thousands of great gin cocktails, but we recommend the ones listed below to wet your whistle on World Gin Day this Saturday. The colder days are here and it’s time to update your wardrobe for the new season. Pia Rossini are here to help, with their beautiful new AW17 range of scarves, hats and gloves. Each piece incorporates autumnal colours, warm materials and on-trend detailing to create your new wardrobe staples. We’ve picked out a few of our favourite pieces below to help you get started and inspired. Click on any image to be taken straight to the Liquorice Tree Gifts website, where the full Pia Rossini range is available for delivery straight to your door. Alternatively, visit us in store in Edinburgh or Glasgow, where our friendly staff would love to show you the new arrivals. It’s officially Autumn, which means that it’s time for everyone’s favourite seasonal activity: cosy nights in! We can’t wait to trade in picnics and sunglasses for long evenings spent under a warm blanket with a good book and a big mug of hot chocolate. We’ve put together our list of night in essentials to help you relax and indulge as the colder weather arrives. One of our favourite brands for beautiful accessories has just launched their new Autumn/Winter collection and we’re in love! The new Katie Loxton range promises rich, autumnal tones and gorgeous designs, guaranteed to become your new wardrobe staples. All of these products, as well as many more, are now available in store and online with Liquorice Tree Gifts, so why not treat yourself or someone you love to some gorgeous new accessories? We are excited to announce the arrival of an exciting new product line to the Liquorice Tree Gifts stores and website! Introducing Orbitkey: the new way to carry your keys. This handy device is the perfect way to keep your keys compact, organised and silent. Your keys are stylishly stored in the order of your preference in a neat stack, so no more annoying jingling. This also means that your gadgets are kept safe from screen damage and scratches. Picking out which greeting cards to stock is one of the most challenging yet exciting tasks for the Liquorice Tree Gifts team. There are so many amazing artists out there with loads of great designs to choose from that we have a tough time deciding which ones are going to make it to our shelves. With some ranges, however, we know straight away that we just have to have them! One artist who really stood out to us at a recent trade show was Louise Mulgrew. Her bright, bold designs are full of energetic colour and heart-warming characters. She runs Louise Mulgrew Designs alongside her dad in Brighton, illustrating the cards while he handles the admin. Many of her designs feature adorable animals in stunning watercolours that we just couldn’t help but fall in love with. We chatted to Louise to find out first-hand what inspires her work and which of her cute creations are her special favourites. 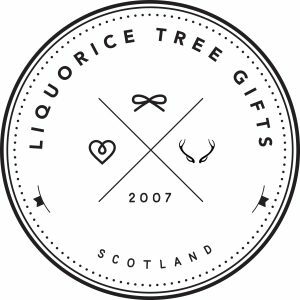 We are so fortunate to call the cities of Edinburgh and Glasgow the home of the Liquorice Tree Gifts shops. Both cities are full of world-renowned buildings and landmarks, so many of which are right on our doorsteps. Such an amazing setting is also enjoyed by many artists, who draw inspiration from the historic beauty. One such artist is Ilona Drew, whose brand I Drew This is best known for its eye-catching Landmarks collection. Ilona uses vivid colours to depict famous landmarks from across the UK, including some of our favourite Scottish sites. Her use of colour reimagines well-known buildings and monuments in a whole new way, capturing their shape and details. Her illustrations are available in the form of prints and greeting cards, both of which can be found on the Liquorice Tree Gifts website and in stores. The Scottish weather is famous for its unpredictability. It’s been known for there to be rain, sun and snow all in the same day! We understand that airline luggage restrictions can be strict, and that packing for such temperamental weather can be difficult. Thankfully, Liquorice Tree Gifts have all the accessories you need to survive Edinburgh’s ever-changing weather and enjoy the Festival to the fullest. Our Edinburgh store is conveniently located just off of the Royal Mile, just a minutes walk from the Edfringe Shop. If you follow us over on our other social media channels then you might have seen us posting about a collection of prints that recently arrived at our Edinburgh and Glasgow stores. Each print features illustrations of the most famous buildings and landmarks in a particular city, all arranged into the shape of the first letter of it’s name. We particularly love that Edinburgh and Glasgow are included in the range, since those cities hold a special place in our hearts. We just can’t get enough of these prints and you guys are loving them too! We decided to get in touch with their designer, Lucy Stephens (aka LucyLovesThis), to learn the story behind her art. Summer is here, which means that once again it’s time for crowds of people to gather in fields for a weekend of camping and incredible live music. Festivals can be a great experience and a lot of fun, particularly because they’re the perfect place to experiment with bolder make up and fashion. Festivals can also have their challenges, however, as accessing washing facilities can be difficult, and it’s not unusual to be feeling less than fresh by day two. Thankfully Liquorice Tree Gifts are here to help. We’ve hand picked our list of essential festival products to help you not just survive the weekend, but to have the best time ever!